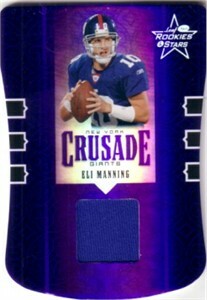 Eli Manning 2005 Leaf Rookies & Stars Crusade card with a swatch of blue jersey Eli wore in an NFL game, card number C-11. Serially numbered #47 of only 150 produced. NrMt-Mt or better condition. ONLY ONE AVAILABLE FOR SALE.